HomeDeconstructing the Mural Permit Bureaucracy Challenge. Yet another debate about the validity of aerosol culture. 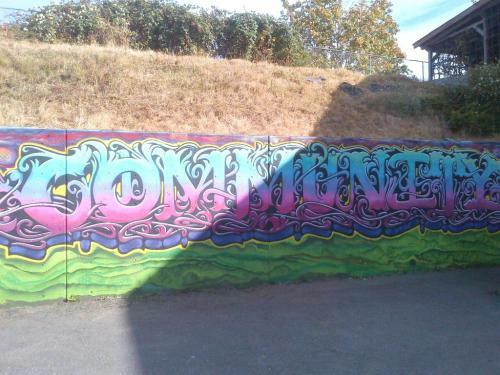 In this case, a property owner commissioned a mural on her property with a positive message, “Community.” In an effort to adhere more to bureaucracy than community values and basic common sense, the city of Duncan is debating whether or not the owner should be fined and the mural should be destroyed because she did not get a permit. Permit processes are one of several bureaucratic attempts to silence creativity. By requiring a permit, a city can censure artwork by committee and paperwork. Group decisions around murals often lead to the sanitization of powerful messages and even permit filing can prove to be a significant hindrance to the mural process. CRP’s mural registry policy initiative advocates for Mural Protection as opposed to restrictions to creating new works. At most, the artist could be asked to get permission from the property owner, if they are available. Permission from absentee owners that do not maintain their property to city blight standards should not be a requirement. There is also an inherent attack on aerosol culture in this policy. By making the debate whether or not this piece is “art or graffiti” inherently invokes a prejudice towards works that are incorrectly labeled with the “g-word.” Would this debate even be happening if the mural was created with brush? Would we be threatening to destroy a mosaic in the same way? The most obvious point here is that this mural is a deterrent to vandalism. Does the city really want another blank wall that can be a target for less evolved writing? Duncan city council will have to decide if it’s art or graffiti. The object of debate is the word ‘community’ painted in bright purple, pink and baby blue letters on the wall between the Garage and the Phoenix Pub on Duncan St. It was painted without a development permit. City Councillor Sharon Jackson explained that it could be against the city’s “unsightly premises” by-law. It’s not something Nicolette Genier was willing to wait for. The owner/operator of the Farm Community Store in the Garage said it would have taken too long to get permission to paint the mural, if she had received it at all. Freedom of expression and a place where young people are comfortable going are two such benefits Genier said are derived from the mural. Jackson pointed out that council’s decision on whether it’s graffiti or indeed a mural could determine the future of art in the city. City council could decide the mural/graffiti should be painted over and that Genier will be fined $100 for failing to get the proper permit. This is Art. Letters or not. Caligraphy was, and still is an ‘Art’.